Camel Man — This man owned a camel and were making a living by getting tourists to pose with the camel and have their picture taken near the basins of the Aghlabides in Kairouan, Tunisia. On the occasion of a group of South Korean women's trip to Tunisia it's Amb. 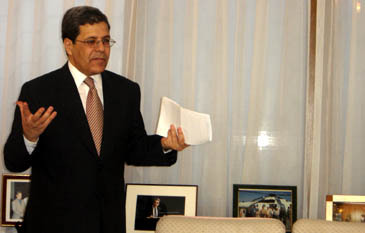 Othman Jerandi in Seoul who volunteered to offer a rare tourism lecture on the North African country at his residence in Dongbinggo-dong in Seoul on Jan. 11, 2005. Composed of college professors, medical doctors, artists, and other professionals the 20-member women's delegation were infatuated by the informative yet amusing narratives of the top Tunisian envoy to Seoul while Amb. Jerandi's wife, Ms Raja Jerandi offered teas and goodies to the listeners. Amb. Jerandi started the introduction of his country by emphasizing the North African nation's geographic closeness to Europe. "Tunisia is located at the junction of the eastern and western basins of the Mediterranean," said Jerandi. "It is only a two-hour flight from Paris and London and a 50-minute flight from Rome." 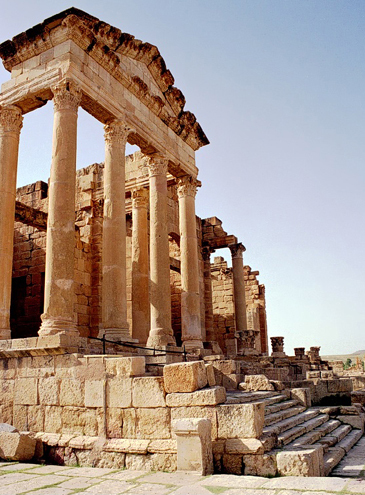 Jerandi said that many civilizations passed through Tunisia over the centuries — Berber, Punic, Roman, Byzantine, Arab, Spanish, Turkish, and French. 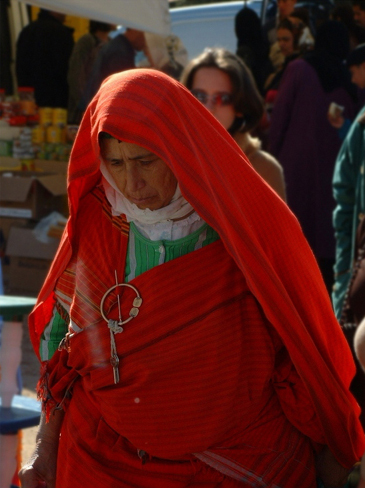 "Of course all of them left an imprint on contemporary Tunisians." He described the national characteristics of his people as "being optimistic." "Tunisians are always optimistic, open-minded, and they are very happy ones," Jerandi said. A recent Gallup survey found that among the peoples of 60 countries Tunisians are most optimistic about the approaching year of 2005. "I was not surprised by the result," Jerandi mentioned. "Even tourists say the label of my country 'smile.'" Jerandi explained that past civilizations left such a powerful impact on Tunisia that most Tunisians are now multi-lingual. The average college graduate in Tunisia is able to speak at least three languages — Arabic, French, and English. "In primary school, children learn French and Arabic, and English is added in secondary school," said Jerandi. "Also Italian and German are widely spoken in Tunisia." Tunisia, according to the top envoy's description, is probably the best country in the whole world as far as free education is concerned, as its government put priorities on developing human resources just the way education walked South Korea up the ladder of economic success. Education is free at all levels of education from primary school to university in the Republic of Tunisia. On top of this, all students get paid some money for either transportation or textbooks. "Tunisia devotes a third of its budget to education," said Jerandi. "Free and compulsory public education is provided for all people at all levels of education." Currently, more than a quarter of its 10 million inhabitants go daily to school. Bourgiba's mausoleum. One of the most beautiful constructions of modern time in Tunisia. This photograph is one of my favorites and still hangs on my lounge wall. Clearly Tunisia does not appear to be blessed with rich natural resources, as Jerandi's comments unfolded. "We don't produce oil and that's why we invest in human resources," said Jerandi. "We want to make our men and women more productive and beneficial to our nation." For Tunisians, education is not the only service available to anybody free of charge. All people in Tunisia enjoy free medical services, which was not common even in former Socialist countries. What is more surprising is 82 percent of Tunisians have their own house. Contrary to the Western conception of or even prejudice towards women's status in Arabic countries, it would be safe to say that Tunisia is "a country of women, by women, and for women." The rate of woman legislators is far higher than most of the so-called advanced countries. "Following the last legislative elections in 2004, Tunisian women won an unprecedented 22.7 percent of the seats in the Tunisian Chamber of Deputies," emphasized Jerandi. "It`s the highest in the world, except for Nordic countries." He said that the average rate of woman lawmakers in the world hover only above 15 percent. Furthermore, seven Tunisian ladies are appointed, either as ministers or vice ministers in the current government, Jerandi commented. Women outnumber men in the education area and in some of the other social fields. Today, Tunisian women account for 56 percent of university students and over half of the teachers in primary and secondary schools are female. Nearly 40 percent of college professors are women while such judicial positions as judges and lawyers are occupied by women representing 27, and 31 percent, respectively. Medical professionals are no exception in Tunisia. 42 percent of medical doctors and a whopping 72 percent of pharmacists are women. Women hold almost three out of 10 engineering positions. Furthermore, nearly 10,000 enterprises are run by women. 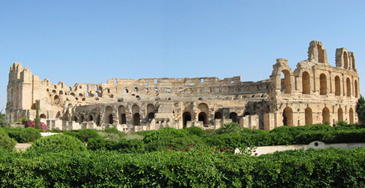 El Djem — The amphitheatre of El Djem is the third largest theatre in world, after Rome's Colosseum and the ruined theatre of Capua. 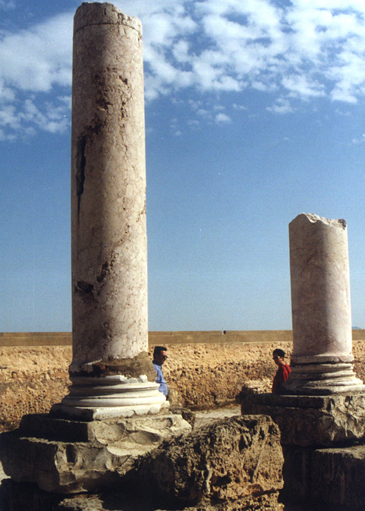 The town of Thysdrus (El Djem's Roman name) was, like almost all Roman settlements, built on the former Punic settlements. Thysdrus prospered especially at the time of Emperor Hadrian (117-138 AD), when it became an important centre of olive oil manufacturing. Thanks to Tunisia's successful implementation of its structural reforms its economy is ranked first in Africa in terms of competitiveness. Recently, the global competitiveness report drafted by the world economic forum of Davos and Harvard University ranked Tunisia 80 developed and emerging countries as regards to competitiveness and business environment. "Exports are the driving force of the Tunisian economy," said Jerandi. He said that the main exports are chemicals, phosphates, food, textiles, manufactured products, and others. The main trading partners are France, Germany, Italy, Belgium, Maghreb States and the US. According to Jerandi's explanation, Tunisia is a pretty attractive nation for investment opportunities. "Tunisia's political and social stability in addition to its economic performances helped our country earn its reputation for investment," explained Jerandi. "We have many investments from Europe and the USA." Presently, Tunisia is an external member of the EU. Nearly half of the ambassador's presentation was allocated to tourism. "We have a deep interest in our tourism industry, " Jerandi began. "We have 6 million tourists every year." Armed with world-class five-star hotels, top-notch facilities, and exciting cultural programs Tunisia offers amazing conditions for holiday travellers. "And it costs amazingly cheap." "A ten-day tour with flying from Tokyo to Tunis and a stay in a wonderful hotel, enjoy playing golf and other services is less expensive than playing golf for five hours in Tokyo," Jerandi pointed out. Many travellers from France, Spain, Italy and other European countries come to Tunisia for weekends because of its convenience and comfort. They arrive in Tunisian resorts on Friday evening or on Saturday only to return to their own place by Monday. "Among other things it is less expensive than to stay a weekend in London for example visiting restaurant, theaters and others," he said. "The flying from major European cities takes only 50 minutes to a couple of hours." 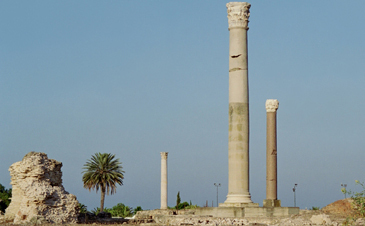 Tunisia has a myriad of exceptional historical treasures including over 20,000 archaeological sites and hundreds of monuments, museums, and historical centers. 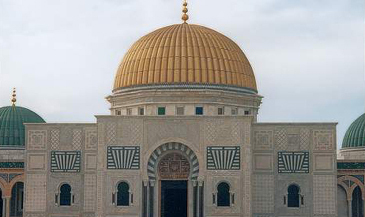 It has as many as eight world heritage sites designated by UNESCO. 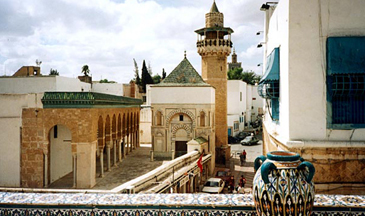 Tunisia was also elected as the world capital of culture in 1997. 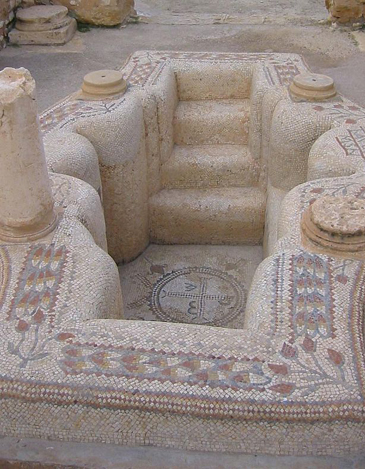 Of these, the most frequently visited are Bardo Museum, El Jem Coliseum, and the Kairouan Medina, and Carthage. 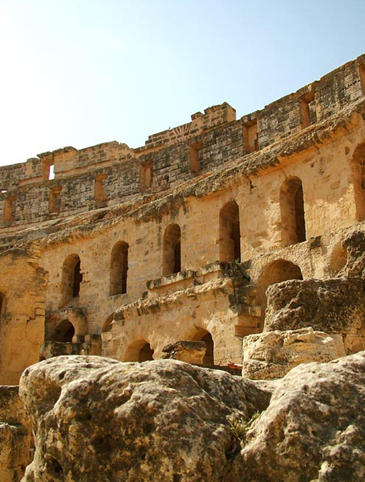 Founded in 814 BC by Phoenicians, Carthage has a theater similar to the Colosseum in Rome. 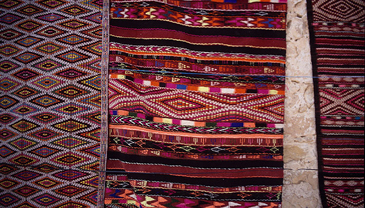 Every year Tunisia organizes several international cultural events including the summer Carthage, Dougga, El Jem, Hammamet festivals as well as the winter Sahara festival of Douz. The world's most famous artists and musicians are invited to these events. Incidentally, the National Theater of Korea performed there in 2004. 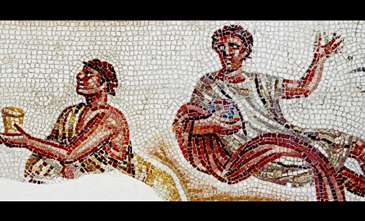 "The biggest in the world collection of Roman mosaics is in the National Museum of Tunisia," he said. 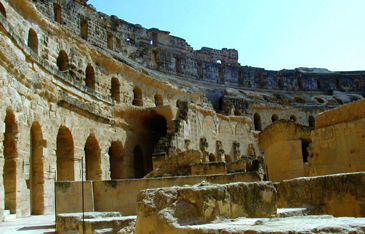 Coliseum — This is the El Jem coliseum on the south east coast of Tunisia as used in the film "Gladiator." 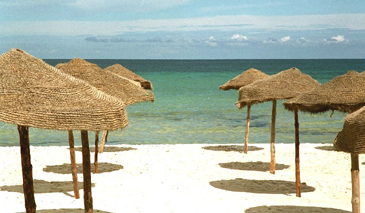 Eco-tourism is an important part of Tunisia's tourism industry. In Tunisia there are large reservations of birds with more than 180 species and an average of 250,000 migratory birds visiting Tunisia annually. "Also we can offer to our visitors the Saharian tourism, the impressive Sahara desert, Jerandi said. "The southern region has very few human traces — wells for survival of nomads, old caravans and fortifications." 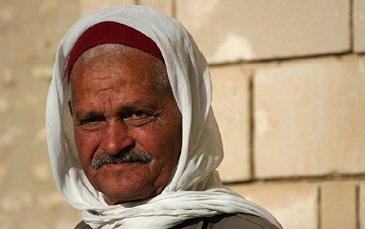 Recently, Tunisia began to develop health tourism. Thanks to the high standard of Tunisia's hospitals and skilled doctors it signed agreements with overseas clinics in European countries so that Europeans can visit the North African nation for treatment, operations, and even transplants. "They do not have to wait too long in their own country for medical services as good as ours," he added. Minerva Temple II — This is a picture of the Minerva temple at Sufetula. The temples in the background are Jupiter and Juno. 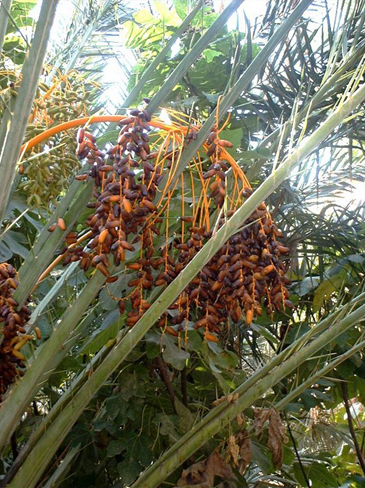 The best date of the world, famous the "Deglet Nour" or " fingers of light " is cultivated in the Tunisian South, mainly with Nefta, and its famous oasis. 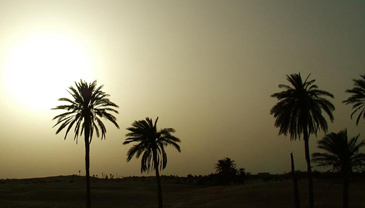 The palm trees planted in quincunxes and following spaced alignments form true groves. The date Deglet Nour is a date gilded with ambree, with an abundant flesh, marrowy, and scented. The above photos were taken from TrekEarth.